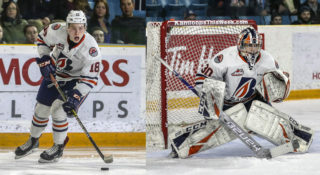 When Kamloops Blazers goaltender Dylan Ferguson was recalled on an emergency basis by the Vegas Golden Knights, it was fair to assume that this would be a temporary move that may last just a few days while the team’s first three goalies recovered. That was more than two weeks ago on October 31. Fifteen days later, Ferguson would get his first taste of National Hockey League action, playing the final 9:14 of the Golden Knights’ game against the Edmonton Oilers Tuesday, where he allowed one power-play goal on two shots. “I’m really at a loss of words right now,” Ferguson said in a post-game interview with the Golden Knights. “I’ve been practicing really hard all week, working with [Director of Goaltending and NHL Goaltending Coach] David Prior. Ferguson was originally drafted by the Dallas Stars in the seventh round, 194th overall, of the 2017 NHL Draft. Two days later, the Golden Knights acquired Ferguson in a trade with defenceman Marc Methot going the other way. 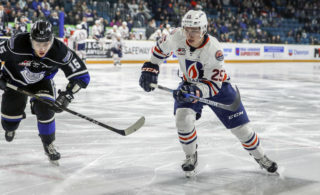 When he signed with the Golden Knights in late September, it seemed like the same formality other WHL players go through in making commitments to their club for the future. In this case though, the future was a defined in the span of a month and not a season or two. “I have a lot of stories, a lot of good ones,” Ferguson continued. “I’m just really grateful to be here and to get that opportunity. This stint with the Golden Knights will no doubt be deemed temporary at some point down the road once the team’s goaltenders heal up. For now, Ferguson is taking it all in stride, even after allowing his first NHL goal. The journey began more than two weeks ago for the 6-foot-2, 195-pound goaltender from Lantzville, B.C. When he first got the call from the Golden Knights, Ferguson was whisked away to New York as the Golden Knights prepared to take on the Rangers. 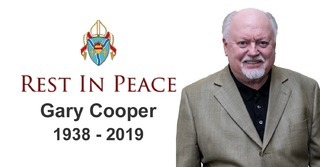 He quickly left a dinner with teammates, packed what he could and was on the ice at the infamous Madison Square Garden soon after. 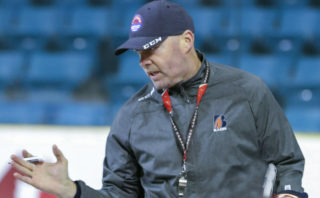 “It was amazing for me just stepping onto that ice and especially watching a guy like Henrik Lundqvist play,” Ferguson said on the WHL Radio Show with Jon Keen last week. “For me that was a guy growing up that was a big role model for me. Watching him play and the way he competes on the ice and just how he does it. As Ferguson’s stay with the Golden Knights has been prolonged, so has the media attention he’s received. Some congratulated him on a Halloween costume while the Golden Knights’ own Twitter account pointed out that he wasn’t yet old enough to set foot on the floor of one of the town’s casinos, but that they “still liked him” anyway. Given how things are shaping up in net for the Golden Knights at the moment, Ferguson’s experience may not have even reached its peak. The health of starting goaltender Maxime Lagace was still an unknown in hockey circles as of Wednesday morning, meaning Ferguson could make his first career NHL start as early as Thursday in his home province against the Vancouver Canucks. With Ferguson making his debut Tuesday, the Golden Knights joined a select list of clubs to use goaltenders for all three Canadian major junior hockey leagues in one season with Marc-Andre Fleury and Maxim Lagace representing the QMJHL while Malcolm Subban represented the OHL. 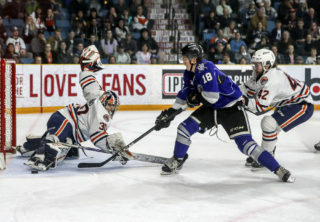 Ferguson was originally drafted by the Blazers in the eighth round, 166th overall, of the 2013 Western Hockey League Bantam Draft. In 60 career games, Ferguson has a 24-29-0-2 record with a 4.05 goals against average and 0.878 SV%. He also has one career WHL shutout since making his league debut Sept. 26, 2015. Still no update on Max Lagace's health…and with no other VGK goalie ready to play…don't be surprised if Dylan Ferguson…from Lantzville, BC and the Kamloops Blazers…gets the start in Vancouver tomorrow vs Canucks.